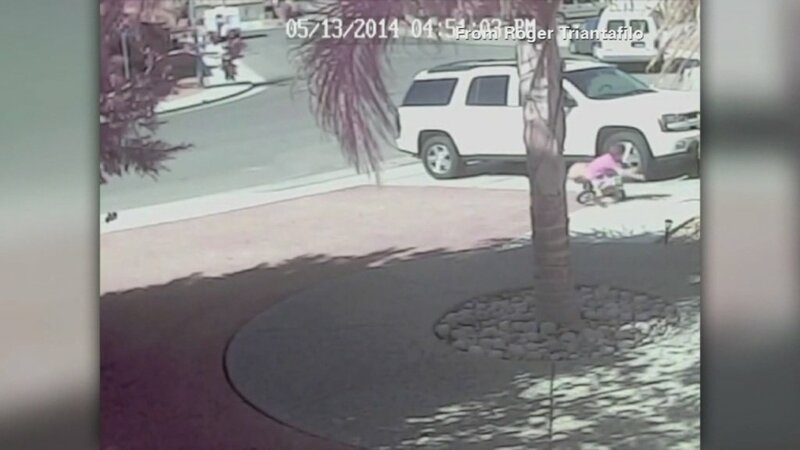 A 4-year-old boy had a lucky escape when his neighbor’s dog attacked him while playing on his bike. The family cat pounced on the dog and chased him off. Jeremy Triantafilo was playing in the drive of his Bakersfield, California, home on Tuesday when the dog attacked him, only for Tara the cat to fly in, hurl herself at the dog and chase it off down the street moments later. The moment was caught on CCTV and became viral the internet yesterday, attracting over 5 million views on YouTube. ABC News went to interview Jeremy Triantafilo and his parents, who explained that Tara followed them home from the park five years ago and has lived with them ever since. The cat immediately took to sleeping in Jeremy’s crib with him when he was a baby, and formed a strong bond with the boy as was proven in her fearless rescue. Jeremy Triantafilo received a nasty bite from the dog that needed stitches, but is now recovering at home.